Cotton Blossom by LOVSPA Fragrances is inspired by the scent of pure cotton linen blowing in the breeze. This fragrance is clean, fresh and powdery soft. Light refreshing mist leaves your space pleasantly fragranced. Top notes filled of Sun Dried Linen Accord Grass and Mandarin Blossom. The elegant LOVSPA® Collection of Reed Diffusers will transform your home into a fragrant spa retreat. Using the science of aromatherapy, our scents are expertly blended to soothe, uplift or restore. Stunningly styled, pleasing to the eye and with mouth watering fragrances to choose from, there is no doubt that our creations make a positive addition to any home. We at LOVSPA® Fragrances understand that home fragrance is a very personal choice with an enormous power to enhance the home and we thank you for your support of our small business. Be sure to check out our Storefront for more revolutionary home fragrance and spa products! Give any space a luxurious ambiance and love the air around you. Thoughtful Gift Idea for women and men, Mom & Dad, Grandma & Grandpa, Aunt & Uncle, Mother in Law and Godmother. Great Housewarming Gift Idea for New Home owners or House Warming Gift Registry. Give an impressive gift to your co-workers, boss, employees or office staff. 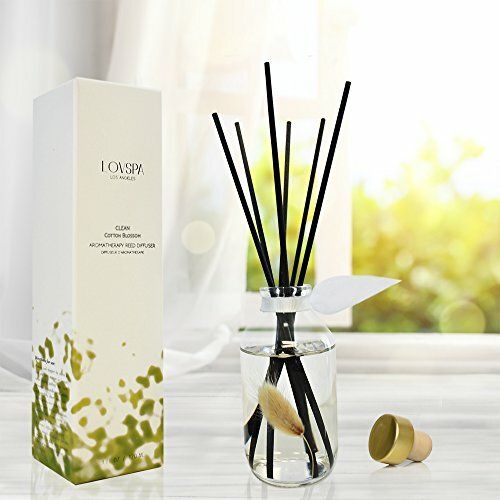 Complete Luxury Scented Reed Diffuser Gift Set with Rattan Reed Sticks, Essential and Fragrance oil, Glass bottle and Gift Box. Reed Sticks Diffuse Essential oils and High Quality Fragrance Oils using bamboo reed sticks. No flame required and easy to use. Home Fragrance Air Freshener for living room, bathroom, kitchen, bedroom or dining room. Great Alternative to Scented Candles, wax melts, wax cubes, potpourri and simmering potpourri. Forget the room spray and use a reed diffuser set instead! If you have any questions about this product by LOVSPA, contact us by completing and submitting the form below. If you are looking for a specif part number, please include it with your message.